This mama loves her boy and loves to cook for him! I’m lucky he lives close enough to stop by once or twice a week; it keeps me from missing him too much. I like to send The Pretty One back to school with things he can heat up for dinner. He cooks for himself, but as a student athlete he doesn’t have the time or the desire to experiment a lot. Without cooking experience it’s difficult to branch out too much, so his menu is fairly limited. He’s trying, though and I think he’ll end up being a pretty good cook. He was raised by professional cooks, so maybe a little of that rubbed off. I make things he can’t or won’t make for himself, and things that have a different flavor profile from his usual repertoire. Translation: I don’t make burgers, brats or spaghetti for him. The Pretty One loves Alfredo sauce, rice and peas, so when I found this recipe I couldn’t wait to make it for him. It does require some prep work — it calls for cooked chicken and cooked rice — but that can be done in advance. 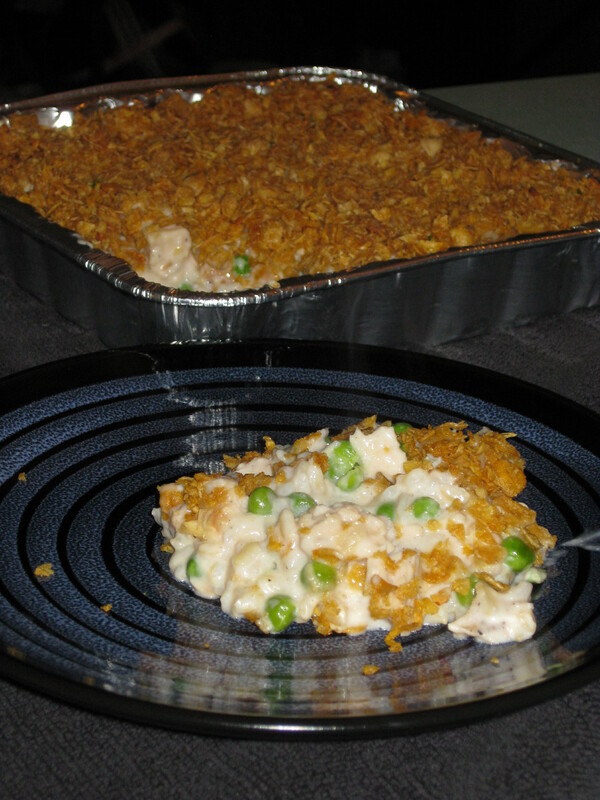 I cooked the chicken and rice in the morning, then threw the casserole together and baked it in the evening. Click for recipe. Like most entrees, this recipe can be adjusted to your taste. I left the peppers and nuts out of the original recipe because I didn’t think they’d be welcome. I didn’t have any basil (What? I love basil!) so I used Italian seasoning. We like peas, but you could substitute broccoli or some other veggie if you prefer. I used brown rice but white or wild rice could also be used. Instead of breadcrumbs on the top, I used crushed corn flakes for a little crunch and topped that with minced garlic for extra pop. 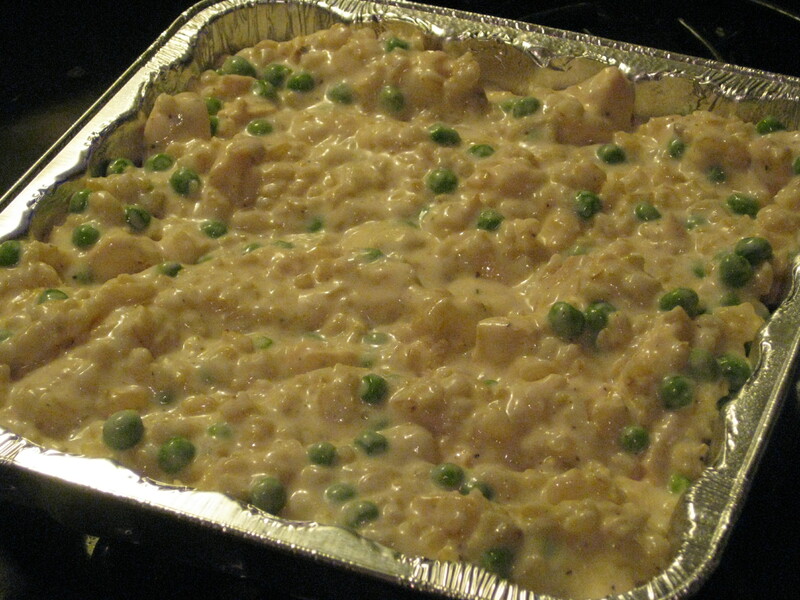 I really like ham, peas and Alfredo sauce together so next time I’m going to substitute ham for the chicken. How did it turn out? I asked The Pretty One tonight. He had a complaint — there wasn’t enough. He wants more. He said it was really good and he ate it within 24 hours. I agree – it did taste good! I had to try a spoonful myself. How else would I know if it was any good? And I had to break into the casserole so I could show you what it looked like, right? This dish is a keeper. I’ll be making it again, but it sounds like I’ll be doubling the recipe next time! I made this with spinach, mushrooms, onions and garlic. I almost made it all veggie, but then added shredded leftover cooked chicken breast. I topped it with cheese and bread crumbs. Yum! Thanks! That sounds good! I hadn’t thought of those additions. Thanks for sharing!